How to lure sharks closer? Cheese is used to lure mice. How about sharks? Sharks do not need to be lured. At least not in Sudan. The giant groupers swarming near the reefs provide a good enough reason for the presence of larger predators. 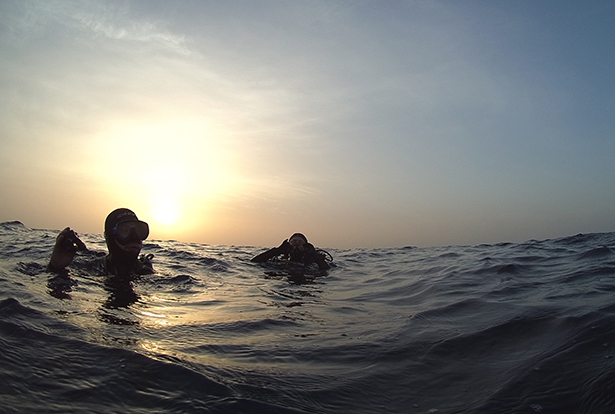 Nothing proves this better than the fact that last week Angarosh was the only site where we did not see any sharks. However a manta was there and stayed with us throughout the entire dive. Looks like this year’s manta statistics will be pretty strong as we have had sightings every week so far. A cloud of barracudas hovered motionless near Shaab Rumi’s plateau out in the deep, right where they were a week ago. A silent group of about 40 barracudas, each measuring at least a metre in length, awaited us again. But they seemed to be dwarfed by the grey reef sharks cruising above the plateau. 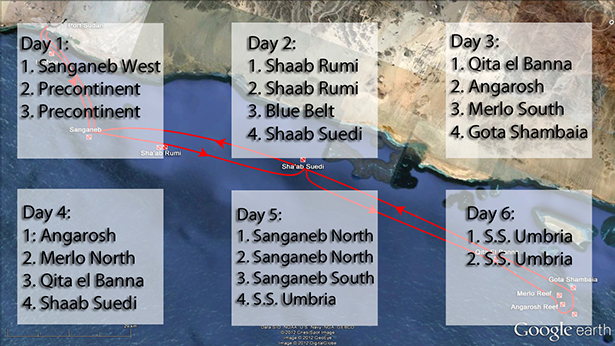 If you are diving at Shaab Rumi for the first time, a “where do I look?” kind of feeling comes over you. 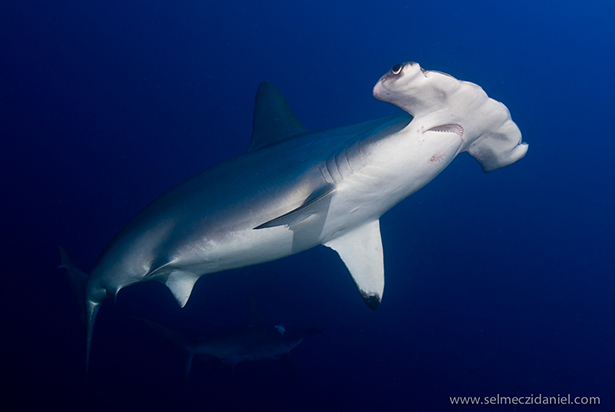 And if you swim out into the deep, you can even check out the hammerheads. Schools of hump-head parrotfish showed up and a curious turtle also had a look at our group. Click on the short video of our tour where you can see all this. You can travel to Sudan only with a valid visa. Your passport must be valid for at least 6 months after the departure date from the country. There must be at least 2 empty pages side by side for the visa. (and 2 empty pages for the 2 Egyptian visas, if travelling through Cairo). There must not be any stamps or visas from Israel in your passport, otherwise you will not be permitted to enter the county. Book by March 26, 2014. We only have 7 available places. Book via e-mail! Posted in Blog, Diving in Sudan, Latest newsTagged diving, scuba, sharks, sudanLeave a Comment on How to lure sharks closer? The special THREE on Andromeda in Sudan! The Sudanese Red Sea is equally spectacular if not better! The more experienced and adventurous divers have been coming here for years but as the word spreads of pristine reefs, healthy shark populations and fantastic wrecks, it’s becoming more and more popular so you may want to keep that to yourself! So what are you waiting for? 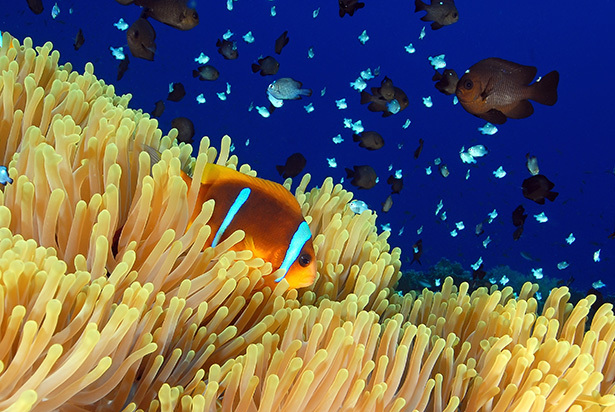 Get in touch with our expert dive consultants to arrange your perfect Red Sea boat vacation! 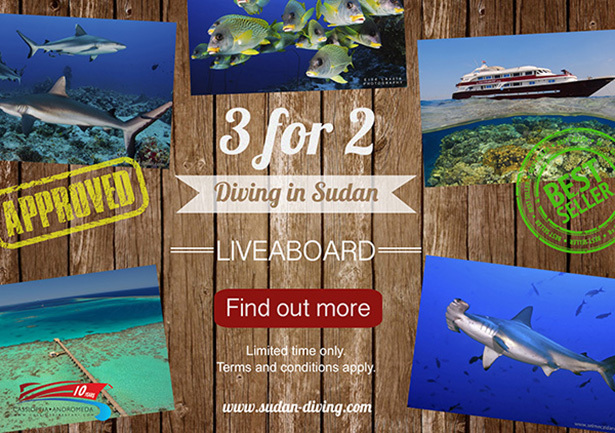 Our February, 2014 promotion in Sudan – the special THREE! Book 2 and the 3rd is free! Only in February, on M/Y Andromeda. Duration: Book by December 20, 2013 to be part of this promotion. Posted in Blog, Special promotionsTagged andromeda, boat, diving, promotion, reefs, sharks, special, sudan, vacation, wrecksLeave a Comment on The special THREE on Andromeda in Sudan! Ladies rock on Cassiopeia in Sudan! Are you a Lady? Are you a Scuba Diver? Are you dreaming about diving with sharks? Then don’t go further: March is the month of shark lover Scuba Diver Girls! The offer is valid only during our scheduled 4 weeks in March, 2014 on Cassiopeia in Sudan! 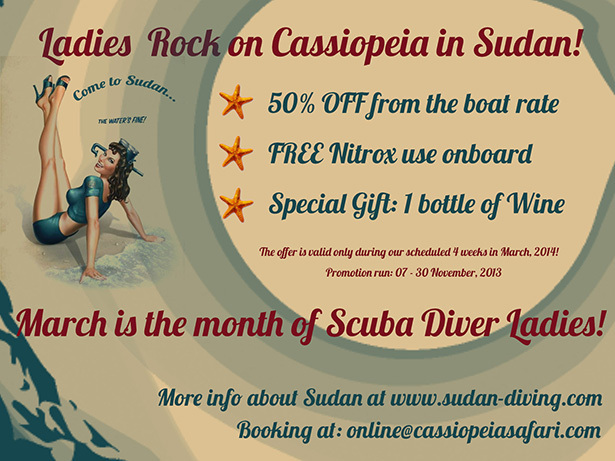 Posted in Blog, Featured storiesTagged Cassiopeia, diving, free nitrox, girls, ladies, scuba diver, sharks, sudanLeave a Comment on Ladies rock on Cassiopeia in Sudan!